Moss happens to be the newest trend in bio-interiors. If you’re looking for a guide on miniature moss gardens, Homes & Gardens of the Northwest recommends “Miniature Moss Gardens: Create Your Own Japanese Container Gardens (Bonsai, Kokedama, Terrariums & Dish Gardens) by Migumi Oshima and Hideshi Kimura (Tuttle Publishing). This 128-page hardback is a descriptive guide to the art of growing moss. The authors introduce the science of moss and its several types. Moss is a small, leafy plant with tufted stems, softs, or matts, growing in damp habitats in the low carpet on tree trunks, rocks, or other areas. There are more than 2500 types of bryophytes that grow in Japan, according to the book. Moss is intrinsic to relaxation and simplicity, giving a tranquil boost to the senses. The genuine subtleness of sublime moss miniature landscapes offer the appeal of ancient gardens which invoke feelings of peace. Each section of the book gives specific characteristics and species’ size. The book also shows how to care for the soft moss, including gathering and grooming. 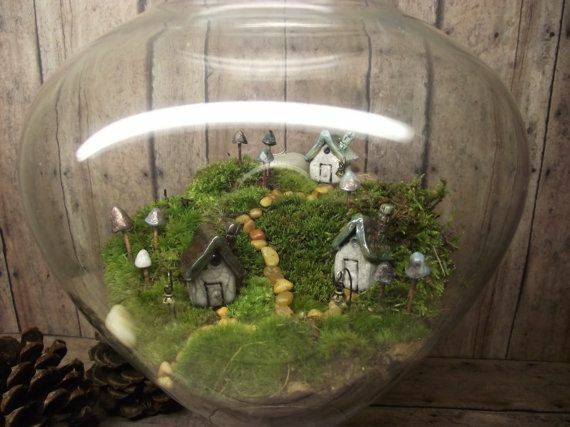 Photographs with pictures give directions on the best way to display moss, such as a moss ball or in a terrarium. Creating a wall of moss around an interior mini-landscape is one choice to explore for your miniature landscape design. There are many ways to approach using moss, ranging from creating harmony with the look of moss to making your landscape tranquil. Moss is the perfect sensory addition, as the feel of moss evokes serenity. Beyond the feel-good aspects, moss is picturesque, making for a terrific addition to any mini-garden. Picking an element like moss is a perfect example of a theme-based element that can complement your mini-landscape design choices. Using a book like Miniature Moss Gardens is one way to creatively inspire yourself, if you include moss your miniature landscape work of art.